How does the fee affect bagging and grocery delivery services? You asked. We answered. Five months after Suffolk County implemented a mandatory fee to discourage disposable bag use, Gov. Andrew M. Cuomo signaled his support recently for a statewide bag ban. Since Jan. 1, shoppers at Suffolk County retailers have paid 5 cents per disposable bag, with a few exceptions. The law took some shoppers by surprise, with questions including why retailers get to keep the money and how a fee could cut down on plastic waste. In January, we published a story explaining some of the more confusing aspects of the charge. Since then, we’ve heard from readers who still have questions about how the bag charge affects them. Here are more of your questions, answered. Has the bag charge actually impacted bag use? Some readers were skeptical a bag charge could really impact bag use or make an environmental difference in the county. Wouldn’t people just pay for the bags and keep using them? The charge does make a difference among Suffolk County residents, according to data the Citizens Campaign for the Environment published April 19. Of 6,000 grocery store shoppers surveyed in April, 43 percent reported they used reusable bags, 0.5 percent used paper and 30 percent reported they had used plastic bags. The remaining shoppers used a combination or no bags at all. A similar survey of 20,000 people the group polled in November and December 2017 recorded only 5 percent of people using reusable bags, while 71 percent used plastic and 1 percent used paper. The 2017 survey is not directly comparable to the April survey because it included more people and shoppers at 7-Eleven stores. The group will repeat the survey with those parameters in the fall. Legis. William Spencer (D-Centerport), the bill’s sponsor, said he thought there was an unexpected motivator involved as well. I’ve noticed that some stores are charging me for bags while others that should be do not. Why is this? So your local Stop & Shop? Yes. Macy’s? Yep, that’s an apparel store and should be charging. But your bagel shop? Dunkin’ Donuts? Those are food service establishments, so the fee is not required. Of course, that language assumes that business owners and their employees are familiar with the new law. In reality, retailers are still adjusting, just like their customers. The county’s Department of Health Services, which enforces the law, has offered stores a grace period, noting on the department’s website that fines — up to $500 per violation — won’t be charged until June 30. Instead, stores found not charging for bags will be “educated on compliance” and asked to correct the problem. Does the charge change who is responsible for bagging? There’s no specific language in the law that mandates whether customers or cashiers are responsible for bagging. That decision is up to stores. Some readers expressed concern that bringing your own bag also means bagging your own groceries, which may be more challenging for people who are elderly or disabled. At Stop & Shop stores, for example, company officials said customers using self-checkout lanes can expect to bag their own groceries, regardless of whether they use paper, plastic or reusable. Customers who would like assistance can use the lanes with a cashier, who can help them with check out and bag their purchases — regardless of bag material..
“It doesn’t make a difference if they purchase a plastic bag or bring their own, our focus is on making their checkout experience as easy as possible,” Cindy Carrasquilla, a Stop & Shop spokeswoman said. If I order my groceries from a delivery service, do I still need to pay the bag charge? For those who shop using grocery delivery services like Peapod or Instacart, orders often arrive in plastic bags. It’s technically both grocery (bag charge applies) and delivery (bags used for restaurant delivery are exempt). Suffolk County’s Department of Health Services, which is charged with enforcing the law, considers grocery delivery to fall in second category. That is, the charge doesn’t apply, said Grace Kelly-McGovern, the department’s spokeswoman. Will anything change if the state adopts the ban? Cuomo’s bill would take bag limitations a step further than the county and ban single-use disposable plastic bags completely. Cuomo had previously blocked a 2016 New York City proposal for a bag charge similar to the one adopted in Suffolk County. Spencer said any state law would supersede the county legislation. A bill would still need to make it through the state Assembly and Senate. Even if the ban doesn’t make it through, other municipalities are adopting their own bag fees and bans. The Village of Sea Cliff adopted a fee on March 12, joining the City of Long Beach. 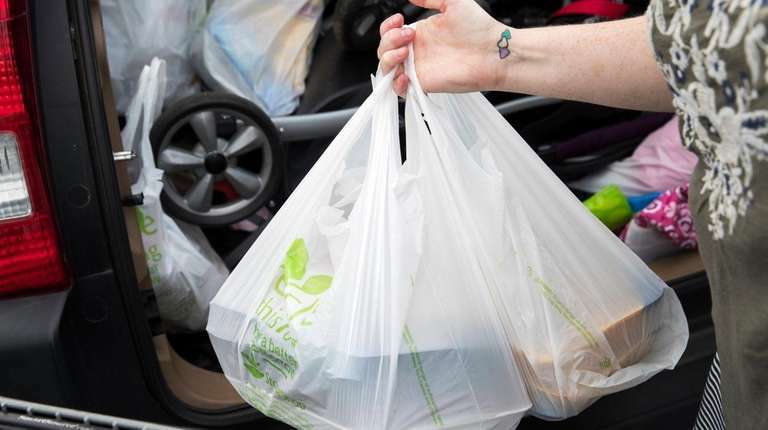 The towns of Southampton and East Hampton have long banned single-use plastic bags. “I don’t know how far it’ll make it politically, but to see the governor take notice of what we’re doing and to take action is pretty telling,” Spencer said. Laura Blasey covers trending stories and breaking news for the Long Island desk. She has been at Newsday since 2015 and is a University of Maryland alumna.